The Parts of an Acoustic Guitar. This lesson is about the individual parts of an acoustic guitar. Even though I list eleven parts, it is not just the parts that make the guitar. The choices that the guitar builder makes in material and the patient, skilled craftsmanship is what make a truly amazing acoustic guitar. The basic parts of an acoustic guitar are the same on all acoustic guitars. The head of the guitar is the flat platform like area at the end of the neck. The head is used as a placement area for the tuners. The shape of the head determines the layout of the tuners. Some guitars have six tuners on one side and other might have 3 on each side. The shape of the head can effect the tone of the guitar because of the way it vibrates. The angle at which the head is attached to the end of the neck will affect the sustain (how long a note sounds) and will determine if the guitar needs string retainer since it affects the tension of the strings going over the nut. A guitar head attached at an angle is much more prone towards breakage if the guitar falls off the stand. The tuners on an acoustic guitar adjust the pitch up and down to the desired tuning. There are quite a few designs of tuners. The better the quality of the tuners, the better it does its job to keep the guitar in tune. In case you have a guitar that you somehow came into and the tuners are not all that great and it goes out of tune easily, ask your guitar tech what his opinion is on the whole guitar. Good tuners are not overly expensive but if its a cheap guitar you might want to get some new strings (which help with sound and tuning stability) and save your money for a quality guitar. The nut is a skinny piece of hard white or black material with slots in it where the strings cross. It sits between the head and the fretboard. The nut guides and keeps the strings in place controls how high the strings are over the fretboard and it is an anchor and transmitter of vibration to the neck of the guitar. The nut can affect the tone of the guitar. It really is a matter of personal taste on this one, but most agree that a good quality bone nut sounds really good on an acoustic guitar. The neck of the acoustic guitar is the long thin piece of wood between the head and body. It holds the head, nut, fretboard, and frets. The quality of wood, shape and connection of the neck to the body affect the sound of the guitar. It also determines if the neck will stay put and not warp or twist. The shape of the neck will make the guitar easier or harder to play, which is a matter of personal preference. Thicker necks will transmit sound in a different way than a thin one. If you can get your hand around it, they sound better. 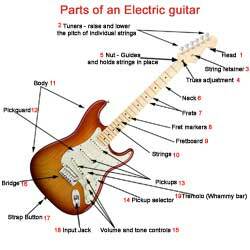 The strings of an acoustic guitar are different than electric guitars. There are a couple of different types of acoustic guitars. Classical guitars have nylon strings and regular acoustic guitars have metal strings. The thickness and composition of the strings make a big difference in sound. 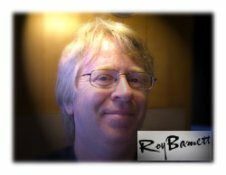 If you know what kind of sound you want ask a knowledgeable guitar tech. They might be able to point you in the right direction on that. Sometimes a famous guitarist that you admire might have their own signature strings and that might help, but the type of guitar they use will figure in on that one. The frets are the parts of an acoustic guitar that are the metal strips that run across the fretboard. You place your fingers behind them and press down while striking the string to produce a note. The frets should be level and smooth on the edges to keep the guitar strings from making buzzing sounds and cutting your fingers on the edges. The fret markers are the parts of an acoustic guitar that do not do anything but let you know where you are on the fretboard. When you play for a while they help you to play all over the fretboard without getting lost. The body is hard to miss. It's the biggest of the parts of an acoustic guitar. It is the resonance chamber where the sound bounces around inside and comes out the sound hole. They type of wood, design and craftsmanship make the difference in the sound. If designed right the body amplify the sound of the guitar by setting the whole guitar vibrating in a way that hopefully sounds good. The sound hole is where the sound comes out and where you lose your pick if you're not careful. The bridge is where the strings are anchored to the body. Vibration is transferred through the bridge and vibrates the body to produce the tone that is unique to the guitar. The bridge pin is one of the stranger parts of an acoustic guitar to me. What they do is hold and anchor the string in the bridge of the guitar. Out of all the parts of an acoustic guitar, These things can be trickiest when you change strings. The best advice I have on this is experiment and talk to your guitar tech if you have a problem with them. I have had mine pop out quite a few times. You have to get the ball end of the strings wedged under the pin just right. Very frustrating. But worth the effort. 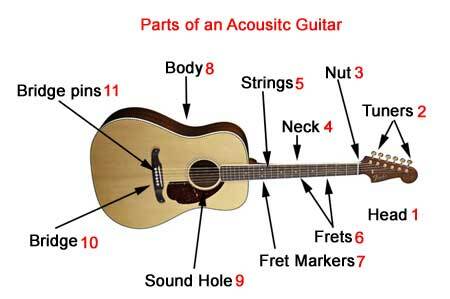 Now you know about the main parts of the acoustic guitar. Each one contributes to the sound that makes each guitar unique. Return home from parts of an acoustic guitar.